Life with Kozo - 03/14/03 - "Emit Flesti"
I never thought I would be writing so many Life with Kozo columns, but it looks like I am. I initially thought this would happen only three or four times a year, but this is fifth one of 2003, and it's only March. Rest assured, this will be the last one for a while. LoveHKFilm.com is moving. Or, more to the point, I'm moving. That's right, Kozo is moving to sunny Los Angeles, where he will hopefully be able to see more films, meet more people, and fill the gaping hole in his heart meant for love. And if I can't do any of that, I'd like to get a dog. That is, if my new residence even allows dogs. But more importantly, I'll be working. Or starting work. Starting relatively soon, I'll be working for an outfit in Santa Monica which is in the process of designing a video game for the unwashed (and even washed) masses. Yes, somebody has seen fit to hire me to provide whatever witty content I can to their interactive electronic endeavor. That that person is also my brother makes my hiring even more obvious. It's not like a real company would hire me. At the same time, this is a start up company, which means the obvious: long hours and heavy workloads, all with the promise of greater success down the road. I certainly think it's possible, since my brother and his partners have a particularly good idea up their sleeves, and they would most definitely succeed with or without my help. If I didn't join them, I could spend even more time polishing up this web site for its future IPO. Sadly, that just doesn't look possible. Not only is LoveHKFilm.com not headed for IPO, but the prospects of a site like this actually making money are pretty much zero. And since I need to make money somehowand legal means are preferredthis new job is the way to go. Which sort of leaves LoveHKFilm.com in the lurch. I'm not certain what people expect of this site. When it first began just over a year ago, I updated it nearly daily. I had time and lots of content to work with. I had over five hundred reviews stored up on my hard drive, and they needed only a little editing before I could publish them. Eventually, I settled on three times a week. I could still write two or three new reviews a week, and edit countless others. I also had the work of other reviewers to edit, which certainly made three updates a week possible. However, those days are pretty much gone. Most of my old content has been used, and with only new reviews to work from, I struggle to find new material. I myself can only complete between two to six reviews a week. My other reviewers write on a volunteer basis, so if they write three reviews a week, great. If they write only three a year, also great. Nobody here is getting paid, so whatever they do is much appreciated. And without an abundance of new content, weekly updates have shrunk from three a week to only two. But, moving to Los Angeles does create its share of issues. And, all of them involve time. How will I find the time to write at least two reviews a week, watch their accompanying movies, update the site, edit other reviews, write new polls, answer e-mail, lurk on the forum AND work sixty hours a week with some hope of sleep? Is it even possible? To be honest, I'm not entirely sure. I am certain that these next few weeks will be difficult on the site, though the importance of that is really debatable. In the grand scheme of things, what happens to this web site is so minor that it becomes silly to even talk about it. I'm sure there are people out there wondering why I waste bandwidth with these self-indulgent musings. Hey, there are bigger things out there: possible war, a suffering economy, duct tape shortages and the continuing drama of Michael Jackson. The future of LoveHKFilm.com is about as important as the next Memphis Grizzlies game, which any basketball fan will tell you means nothing. But hell, it matters to me. And, I've actually received the question, "What will you do about your web site when you start working again?" It's been intimated that I should quit this endeavor, and admittedly it would make things easier. Still, I'd miss it. And besides, in the last month this site has taken on some $145 in charitable donations. That number, while only covering the recent webhosting and domain name expenditures, does matter to me because it means that five or six individuals out there enjoy the site enough that they'd like to contribute something to keep it going. And I wouldn't want to disappoint any of those people. Nor would I want to disappoint the silent reader who enjoys the site too. And, I would also like to keep the site going to tweak the people who write in to tell me that I'm a bad, bad person. But to do that, I need time. Not just in the literal sense, but also in the form of people's time. I hope the people who enjoy this site can be forgiving when I inevitably miss a Monday update, or go two weeks with only a total of two new reviews. I hope people will forgive the likely errors in political correctness, which will probably occur when I write things without editing them. And, I hope people will continue to forgive the excess of jokes this site makes about certain Hong Kong personalities. At the same time, I do think about the way, way future. What if (and we're talking a big if), I settled down, got married, and started a family? I would probably still watch movies, but would I have time to review them? And what about keeping up a web site? I'd like to think that this site has more than a few years left, and I actually own the domain name until the year 2008. But seriously, I'll be thirty-five then. And if I haven't started a family by then, I will most definitely be thinking heavily about it. And, if I'm not thinking about it, I'm sure my parents will be calling me every other day to remind me to do so. But hey, there are more important things in this world. And if it's really such a big deal in 2008, I'm sure I can always write another one of these columns. Great Teacher Onizuka by Toru Fujisawa, is a 25 volume manga series about the exploits of unconventional teacher Eikichi Onizuka. The manga ceased publication in 2002, and is currently being published stateside by Tokyopop as part of their Authentic Manga line of graphic novels. 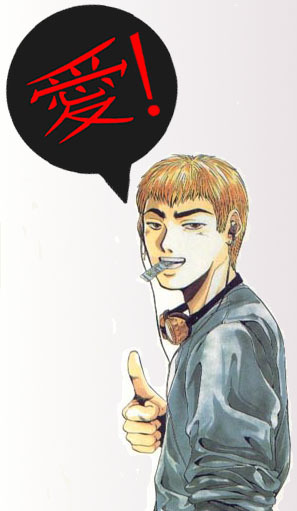 Also called GTO, the manga has also seen life as a 43 episode animated series and a 12 episode TV serial starring actor Takashi Sorimachi (Fulltime Killer) as Onizuka. There was also a 1999 theatrical film, which starred Sorimachi, Norika Fujiwara and Rena Tanaka. The Webmaster is a big fan of Great Teacher Onizuka, though he thinks the movie wasn't really that good.